Russia Deploys Su-25 Jets & Helicopters to blocks passage in Kerch Strait Near Crimea. Russia has blocked passage through the Kerch Strait, a narrow body of water nestled between Crimea and the Russian mainland. The move came after three Ukrainian navy ships made what the Russian coast guard has called an unauthorized crossing through “Russian territorial waters”. Russia has stopped all navigation through the Kerch Strait, the only passage into the Sea of Azov amid growing tensions with Ukraine. 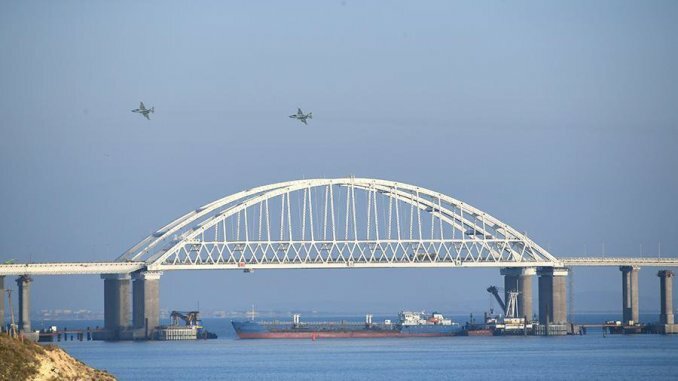 Videos coming from the scene show a cargo ship, accompanied by two Russian military boats blocking the passage under the arch of the Kerch Bridge, which connects Crimea to Russia. The blockade started at around 12.00LT on Sunday, Nov. 25, 2018. According to the Russians, the Kerch Strait was closed because three Ukrainian vessels sailed through the Russian territorial waters without authorization. “Russian coast guard vessels … carried out openly aggressive actions against Ukrainian navy ships” during the transit, a Ukrainian Navy statement said. The statement added that Russian authorities had been informed in advance about the planned transit, involving a Ukrainian navy tugboat, along with two Ukrainian Navy artillery boats, moving from Odessa on the Black Sea, to Mariupol, in the Sea of Azov. 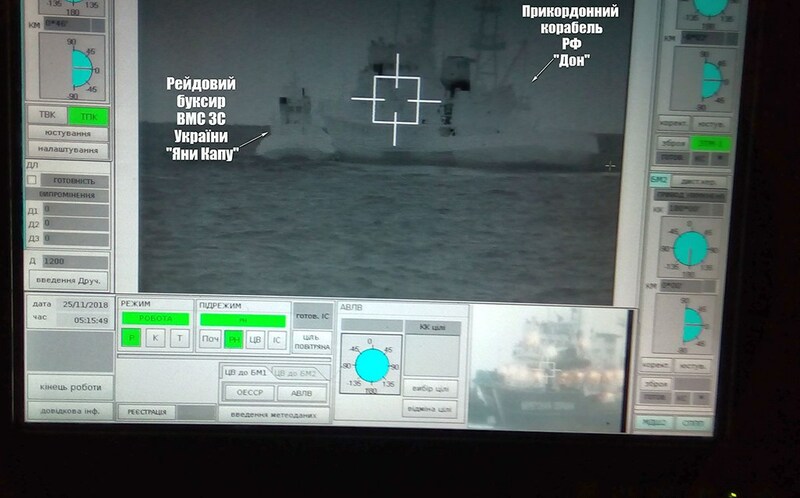 The image released by the Ukrainian Navy. In accordance with Articles 17, 38 of the United Nations Convention on the Law of the Sea (hereinafter referred to as the UN Convention) and Article 2 of the Treaty between Ukraine and the Russian Federation on cooperation in the use of the Azov Sea and the Kerch Strait (hereinafter referred to as the Treaty), Ukrainian warships enjoy freedom of navigation in the Kerch Strait and the Sea of Azov, and therefore can pass through the Kerch Strait at any time, subject to the safety of navigation. For reference. Article 17 of the UN Convention provides that, subject to compliance with the Convention, vessels of all states, both coastal and landlocked, enjoy the right to peaceful passage through the territorial sea. Part 1, Article 36 of the UN Convention states that in the straits referred to in Article 37 of the UN Convention, all ships and aircraft shall enjoy the right of transit passage which shall not be obstructed. Part 1 of Article 2 of the Treaty provides that merchant ships and warships, as well as other state-owned vessels under the flag of Ukraine or the Russian Federation, operated for non-commercial purposes, use the freedom of navigation in the Sea of Azov and the Kerch Strait. Also, it should be noted that the trane of the boundary vessel of the Russian raiding tugs “Yana Kapu” falls under the signs of an act of aggression in accordance with the definition of Article 3, paragraph d), of Resolution No. 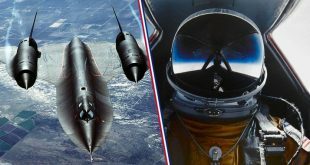 3314 (XXIX) of the General Assembly of the United Nations of December 14, 1974, namely: act aggression is, in particular, an attack by the armed forces of the state on land, naval or air forces, or naval and air fleets of another state. A 2003 treaty designates the Kerch Strait and Sea of Azov as shared territorial waters between Russia and Ukraine. However, Russia has been asserting greater control over the passage since 2015. Noteworthy, the Russians enforced the blockade dispatching also Su-25 Frogfoot attack planes, which were spotted overflying the bridge area several times. At the time of writing, dozens of cargo ships are stuck, waiting for the passage to be reopened, based on AIS (Automatic Identification System), an automatic tracking system used by ships and Vessel Traffic Services (VTS) for identification and geo-localization of vessels, by mutually exchanging data with other ships and AIS Base stations. The AIS is the naval homologous of the ADS-B used by airplanes and it is used for collision avoidance, search and rescue, accident investigation and for aids to navigation. It is mainly used by commercial vessels even if some military ships transmit AIS data.